Vermont Beers for You – Now with 100% More for You-ness! The smoke has cleared, existing deals have been figured out and I now have a final count. It’s time to set my stockpile of yellow, silver and green cans to work as a commodity and trade them wantonly. 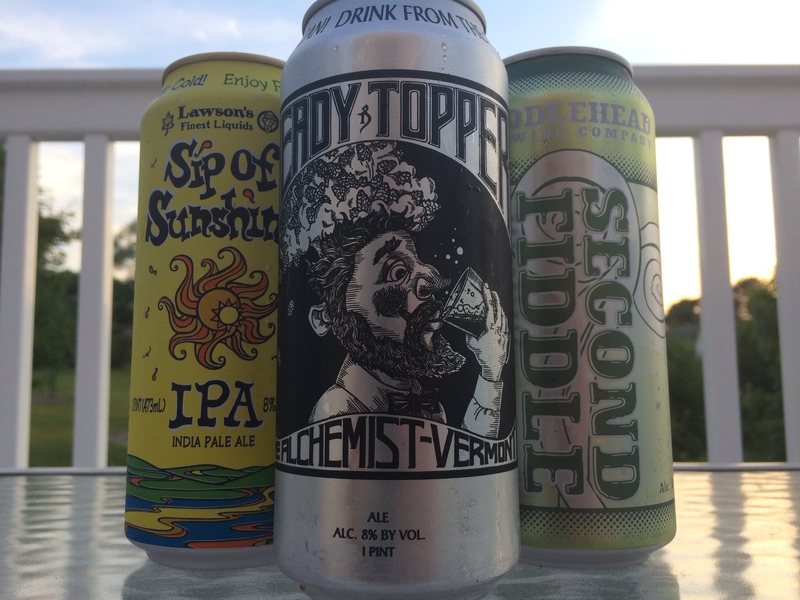 3 bundles are available consisting of 1 Heady Topper, 1 Sip of Sunshine, and 1 Second Fiddle with a potential for a 4th bundle from my personal supply should this prove popular and I get the right offer. If you are interested in a single can trade, I might be able to do that as well, so feel free to inquire. You think the beers you’re trading are good. That’s pretty much it. You can either get in contact with me via Facebook or contact me directly via email: drewsbrewsreviews@gmail.com. Include the 3 beers you are offering and a picture of a puppy (just for heart warms). If I get more than a couple offers, I’ll choose randomly to make it as fair as possible. I’ll probably cut this off around June 23rd and get in contact with the traders to set up the details. Yeah, beer!